The menopause is associated with a larger risk of developing osteoporosis, or brittle bones. What do you need to know about ways to prevent this condition, risk factors, and treatment? Are you approaching the menopause or have you already hit it? Osteoporosis should be on your radar. Osteoporosis — and condition in which you have brittle bones that have lost mass and strength — doesn't itself have any obvious symptoms, but it greatly increases your risk of fractures. Over 200 million people across the globe are thought to suffer from osteoporosis, and that includes more than 50 million older people in the US. Why does the menopause increase your risk of osteoporosis? People under 30 tend to make more bone than they lose, helping them maintain strong bones that are less likely to break. That changes with age, and as early in life as 35, your body will lose more bone that it produces. This gradual decline in bone mass impacts women more than men, as they have thinner and lighter bones and are more likely to live longer. Menopause, of which declining estrogen levels are one of the main features, is directly linked to a loss of bone mass — and after you've hit this big milestone, it's especially important to take steps to look after your bone health. Women who go through the menopause prematurely, and as thus exposed to less estrogen over their lifetimes, are at the greatest risk. Does osteoporosis come with any symptoms? The loss of bone mass associated with osteoporosis doesn't itself have any symptoms, and that's part of what makes the condition so dangerous. Osteoporosis does, of course, place you at a higher risk of fractures — and it's when you break a bone, often after a fall, bump, or even a sudden wrong movement, that you're most likely to find out you have the condition. Osteoporosis can also lead to spinal deformities, and some people find out they have it after they or their doctor notice they're getting sorter, have a hunched posture, or suffer from chronic back pain. Bone mineral density tests can diagnose osteoporosis — so ask your doctor if you need one. That way, you can take steps to manage the condition before disaster strikes. There are plenty of things you can do to keep your bones strong and help prevent osteoporosis — and that starts with staying away from unhealthy habits. We all know that too much alcohol causes all sorts of adverse health outcomes, and that smoking does the same. You may not know, however, that nicotine lowers estrogen levels, and that drinking too much can do the same, along with lowering your calcium levels. Drink in moderation, then, and quit smoking if you're currently a nicotine addict. In addition, diet and exercise can also go a long way toward decreasing your risk of osteoporosis. Strength and resistance training, particularly, build stronger bones as well as stronger muscles. That doesn't mean you have to lift weights, though — walking, jogging, hiking, climbing, and even dancing are all examples of exercises that build strength and help prevent osteoporosis. Try to get at least 150 minutes worth of exercise in each week, and include cardio workouts as well. The increased flexibility exercise gives you may also lower your odds of falling, thereby making it less likely you'll end up with a fracture. You could also ask your doctor if you need to take a calcium supplement (calcium carbonate and calcium citrate are excellent choices in that case). Do stick to the recommended dose though, and try not to exceed 2,000 mg of calcium a day, as that can cause kidney issues. Vitamin D is special, in that sunlight is its main source — the majority of people can make enough vitamin D if they just spend half an hour or so in the day each day. Eggs, fatty fish, beef liver, and cheese are good food sources, along with products fortified with the vitamin. Because vitamin D plays a crucial role in calcium absorption and helps prevent osteoporosis, your doctor may also recommend you take a supplement. If you're 50 or above, you can take 400-2,000 IU of vitamin D per day, but don't exceed 10,000 IU. If you take any of these, talk to your doctor about how to reduce your risk of developing osteoporosis. 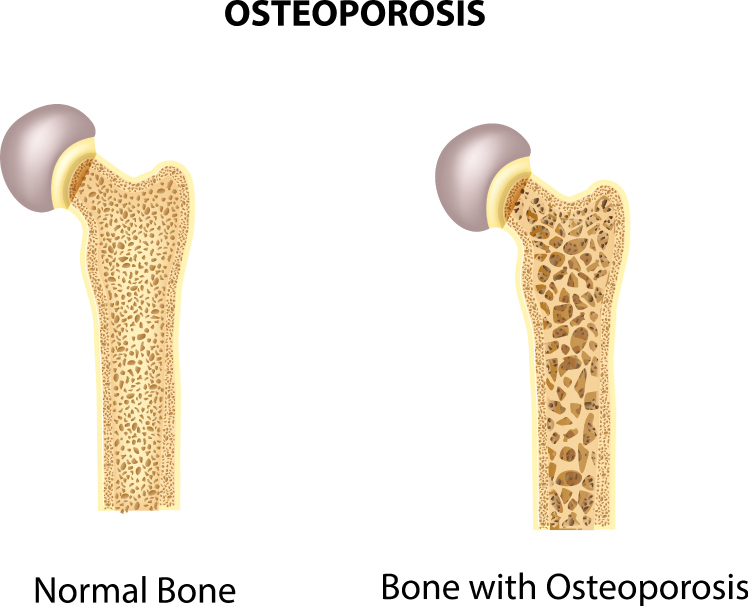 What do you need to know about hormone replacement therapy and osteoporosis? Hormone replacement therapy combats many menopause symptoms and is also thought to help slow the rate at which you lose bone mass. Because it has been linked to health risks like breast cancer, blood clots, gallbladder disease and hypertension more recently, many women will not want to take it — but discuss the benefits and risks with your doctor before making a decision. Are at a higher risk of developing osteoporosis because they are especially petite, have a family history of the condition, or take medications that place them at a higher risk. Are there any alternatives to HRT?